World’s Best Fuel Additive. PERIOD. These issues that can cause significant damage to engines and cost your business time, money, and clients. It’s no question that fuel additives are fundamental for a smooth operating watercraft. Fuel Ox™ fuel treatments protect and prevent common fuel related issues. These military grade additives are highly concentrated and improve combustion and overall engine performance. Captain Frank of the fin chasers thought Fuel Ox Marine was like all the other additives, until he saw dramatic fuel savings and a better performing engine. The addition of ethanol in fuel has become commonplace throughout the United States. Traces of ethanol have even been found in diesel. Although supplementing fuel with ethanol has its environmental and economical benefits, it comes at a price for the boats that run the ethyl alcohol through the fuel system. Ethanol can corrode the plastic, rubber, or metal found in fuel systems, attract water to the fuel, which in turn can lead to phase separation. This can lead to total engine destruction. Signs that ethanol may be affecting your engine is rough running and performance of your boat, a significant decrease in fuel economy, as well as engine damage and the need for costly repairs. Fuel Ox Marine™ coats your fuel system with a film to prevent ethanol from corroding the plastic, metal, or rubber in your fuel system, removes water, all while keeping fuel stable and protecting against the process of phase separation. No one likes soot and smoke. Not only is it unsightly on your transom but it also looks unprofessional and everyone knows its bad for the environment. Thankfully, Fuel Ox Marine™ has been shown to substantially lower CO2, NOx, and many other types of emissions. Fuel Ox Marine™ contains an organometallic combustion catalyst. This patented catalyst lowers the combustion point in diesel by over 200°F and generates a longer burn.The incorporation of this unique technology enhances Fuel Ox™ by providing the user a cleaner, more thorough combustion. Due to this more efficient combustion there is a significant reduction of unburned fuel and emissions such as soot or smoke being diffused into the atmosphere. When it comes to your boat, water can be your best friend and then quickly become your worst enemy. Water is the key component for initiating phase separation and corrosion, degrading the quality of fuel, or complete and total engine destruction. Injecting water with fuel can cause your engine to cut out, create irregular idling, or produce gums, sludge, and varnishes which can cause injectors to malfunction. Darkened fuel, as well as black or white smoke can indicate a significant level of water in your fuel. Fuel Ox Marine™ is prepared to protect against water in your fuel and passing through the engine. It was designed with a demulsifier that will filter water out of fuel and disperse it into the engine’s racors, separators, or filters. Fuel Ox Marine™ also contains properties to protect your tank and other metal surfaces against the corrosion from water in your fuel. Getting the most out of your fuel becomes a priority with unpredictable trends in fuel pricing. With Fuel Ox Marine™, you can be confident knowing your money will stay in your pocket, and out of the pump. Fuel Ox Marine™ contains a patented combustion catalyst that creates a more thorough burn of the fuel, resulting in about 7-10% better fuel economy. This catalyst promotes a more complete burn of the fuel, so the user is getting the most out of the fuel as possible. The less fuel that is wasted, the further a tank full of fuel will go. This also results in more power and responsiveness. Both gas and diesel can begin to degrade in three weeks, In fact, with today’s Ultra Low Sulfur Diesel it can be become unusable within one year while bio-diesel blends have a lifespan of only half of that. With bad fuel, comes corroded fuel injectors, clogged filters, an increase of emissions, loss of power and lower RPMs, even engine failure. Fuel Ox Marine™ keeps fuel stable and prevent fuel degradation for up to two years. If you’re looking for a simple stabilizer, Fuel Ox carries our winterizer treatment, Fuel Ox Winter Shock™, which will keep fuel stable for up to two years and prevent fuel from degrading. Ultra Low Sulfur Diesel, or ULSD, refers to the process of removing the sulfur in diesel fuel. While reducing the amount of sulfur in fuels does provide less expensive and “environmentally friendly” diesel, it has one major drawback: reducing the amount of sulfur reduces the lubrication necessary for an engine to function properly. Sulfur is a natural lubricant when added to the fuel, promoting an efficient and smoothly operating fuel system. However, removing the sulfur from diesel causes a significant decrease in the lubricity for injectors and upper cylinder heads, causing corrosion and wear on the pumps, and ironically an increase in emissions. 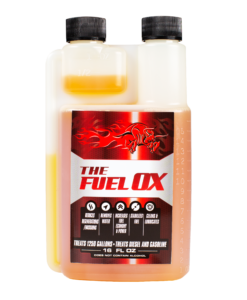 Fuel Ox Marine™ replenishes lubricity that is lacking in today’s fuel. Maintain the performance of your engine by treating your fuel at every fill up with the Fuel Ox marine™ additives. Select below which additive is right for your boat.